Argonne National Labs shares this video of a 50-million cell, high fidelity CFD simulation of a diesel engine. You can read more about it here. The Maritime Research Institute of the Netherlands has a new 4,000 core cluster on which customers can run their CFD code ReFRESCO. This Ohio State Univ. designed car set a land speed record of slightly over 212 mph. Image from International Science Grid This Week. Click image for article. How would you like to have 36 cores on your desktop? You can with the new Intel Xeon E5 v3 if you have two. The Call for Papers is open for Nvidia’s 6th GPU Technology Conference. What CAD/CAE/PLM providers made the list of the top 500 cloud apps? Autodesk was ranked highest at 120. If you like your CAD free and in the cloud, try the beta of Honeycomb3D. It’s designed for 3D printing. The ParaView User’s Guide is getting reworked for the 4.2 release. 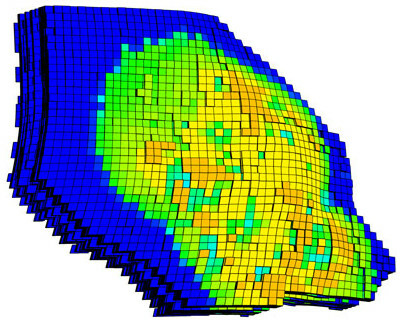 Tecplot RS 2014 R1 is now available for visualization of oil and gas reservoir simulations. This oil saturation plot is an example of one new feature available in Tecplot RS 2014 R1. Image from Tecplot. It’s nice to see Prof. ZJ Wang blogging again about high order CFD. The SolidSmack CAD blog surveyed CAD jockeys to find out what they find most annoying. It should not surprise anyone that the most annoying thing in CAD was “Getting 3D data from one CAD app to another.” You might be surprised by #2. How good of a deal is an undergraduate engineering education? Of all majors surveyed, engineering has the best ROI at 21% versus an average return of about 15%. Boeing’s use of products from MSC Software will extend through four decades with the recent agreement to a 5-year extension of the licenses. FS Dynamics will be using CD-adapco‘s software for another 3 years according to a recently signed deal. We have each experienced times when we’re so frustrated with our work that we’d like to toss it all in the trash or burn it. 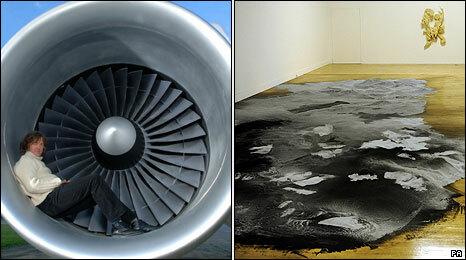 Artist Roger Hiorns has elevated such destruction to fine art by atomizing an entire jet engine. He started by melting the engine and spraying the resulting liquid through a nozzle where it mixed with water. This caused the liquid engine to condense into droplets that became a fine powder. Therefore, you can say that fluid dynamics was involved in the process. The result, shown below, was a candidate for the Turner Prize in 2009. It’s kind of a cross between those “Will it Blend” videos and those pictures of disassembled objects with all their components neatly arrayed. Roger Hiorns’ atomized jet engine. Originally seen on Today and Tomorrow. Image from BBC News Magazine. I’m certain that my friends at General Electric, Pratt & Whitney, Rolls Royce, and the other engine manufacturers will enjoy this. In fact, this would be a good piece to install in the lobby of their corporate headquarters. This entry was posted in Applications, Events, Hardware, News, Software and tagged CAD, CD-adapco, CONVERGE CFD, Honeycomb3D, MSC, NVIDIA, ParaView, Pointwise, ReFRESCO, Siemens PLM, Tecplot, visualization. Bookmark the permalink. In regards to the higher order mesh discussion, I’m under the impression that higher order solvers are not used to gain engineering accuracy on a coarser grid, but instead to gain more (i.e. scientific) accuracy on a given grid. For example for tracking vorticity and LES/DES turbulence models. I’d be curious to see how a better representation of a nonlinear surface actually affects the solution.